…Every Friday on both cruises. Players can earn entries Saturday – Thursday prior and must be present to win. Receive a free Big “M” Casino T-Shirt now through December 22nd when you bring us canned and non-perishable items for the Helping Hand of North Myrtle Beach. All players who bring an item will receive a t-shirt! Monday, Christmas Eve AM Cruise: 11:45am – 5:15pm (no PM cruise). Tuesday, Christmas Day PM Cruise: 6:45pm – 12:15am (no AM cruise). Monday, New Year’s Eve, (12/31) is by invitation only. 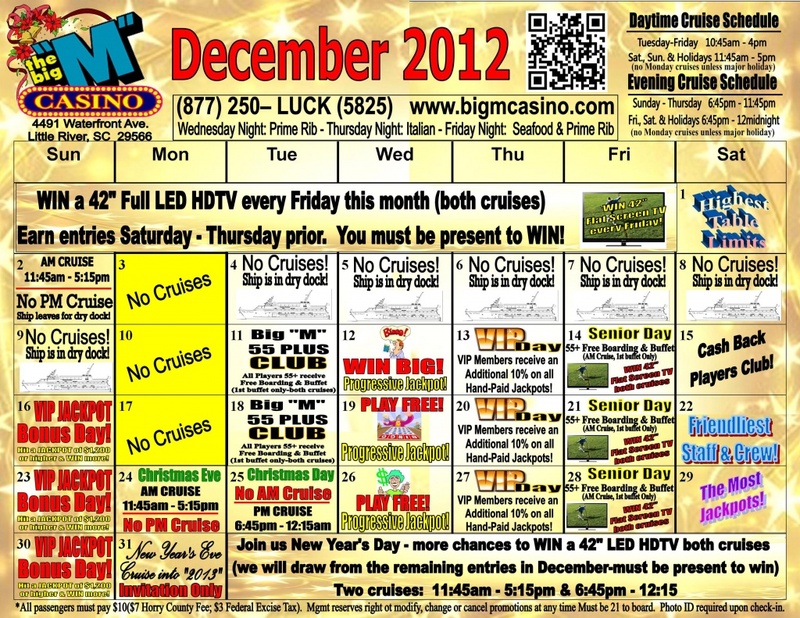 Tuesday, New Year’s Day we will also be giving away 42” Flat Screen TV’s on both cruises. We will draw a WINNER from the non-winning entries from December (must be present to win). Join us for BINGO every Wednesday, both cruises. Progressive Jackpot is at $2700 – VIP Jackpot Bonus Day every Sunday. VIP’s who hit a JACKPOT of $1200 or higher WIN MORE! Platinum receives an additional $300, Gold receives $200, Preferred receives $100 and Silver receives $50 – VIP Day every Thursday, both cruises. VIP slot players receive an additional 10% on EVERY HAND-PAID JACKPOT! Don’t forget to check the events calendar for all the other specials. Play our Vegas-Style casino games like the Blackjack Table, Craps Table, and Roulette Table. Try our new multi-line slot machines too. Make sure you join our Player’s Club where you can earn points for cash back! Make your reservations on the Myrtle Beach Casino Cruise today! Have questions or want more information – contact us or call 843-249-9811 or 877-250-LUCK Toll Free!